The tale opens with Taw Jackson played by America’s defining western actor John Wayne returning from prison. This film is indeed a rarity as Wayne for the first time in his career plays a villain. He is bent on recovering his fortune which was stolen from him by antagonist Frank Pierce after being wounded in a shoot-out. At his ranch Jackson decides to make a deal with Lomax (Kirk Douglas), the very man who shot him five years ago to join forces against Pierce and steal a large gold shipment. The gold is transported in an armored stage coach called “The War Wagon” that is very heavily guarded. This is a classic example of vigilante justice as these two men collaborate in assembling a team of men to stage a hold-up to regain Jackson’s lost gold. This was one of the last films Dimitri Tiomkin scored. It is a classic western, a genre for which Tiomkin had demonstrated great success over the years with such hits a “The Alamo”, “High Noon” and “Rio Bravo”. Though born a Russian Jew, Tiomkin must have had American blood in his veins as he time and time again like fellow Russian Irving Berlin brought forth classic Americana sound with his music. For the film, not much music was recorded as the score comes in at just over 43 minutes. The score opens with the classic Americana main theme carried grandly by French horns. After reprising the theme with harmonica which provides a folksy tone the music swells as the theme makes a powerful statement with full orchestra. Without much pause the cue segues into the “Ballad of the War Wagon”, a song sung by popular Ed Ames. This song carried by percussion and banjo is just classic Americana. Like most western classics it has a forthright expression and simple lyrics. The song sets the tone for the film and for me gets the CD listening experience off on an upbeat note. The cue “Enter Pierce” opens strongly with an upbeat rendering of the main theme which is emblematic of the War Wagon and Pierce’s power and standing in the community. The music slows and transitions to a light-hearted underscore carried by violins and woodwinds. There is almost a playful quality to the music. With “Lotus Leaf/Fivestone Shaving” we are treated to a playful variant of the main theme performed by woodwinds. A harmonica then takes up the theme in earnest only to then also become very playful if not silly. This is a most amusing cue. “Livery Stable” is I surmise a suspense cue that opens abruptly with drums and muted brass. As the cue develops we are treated to an rich array of textures by woodwinds, strings and harp that seems to me portentous. It is a most interesting listen. “Lupe” was a welcomed surprise as it is a classic Golden Age theme that opens tenderly with guitar, woodwind accents with a hint of Mexican flavor. After a playful if not quirky interlude the theme returns carried by violin, flute and oboe, and ends with a muted restatement of the main theme. “Friendly Indians” introduces a secondary theme of the score which I believe provides a good contrast to the horn borne main theme. It is a busy theme, a light theme that treats us to a lively display of woodwinds for the entire cue. There are some brief interludes with string and brass accents as well as the main theme heard as a fragment, but by and large this cue is for the woodwinds. As a lover of the woodwinds, I just loved this piece. With “Indian Trades” we again hear this secondary theme but this time it is much more animated and instead carried with strings and muted dissonant horns. The light-hearted and playful “Cuarto Cinco” is an entertaining cue, but about two-thirds of the way it becomes serious and slows in tempo. The cue ends on a note hold and leaves us hanging. “Chores/Knife Talk” is a restful if not contemplative cue that opens with solo flute and guitar. A harmonica takes up the melody adding a folksy charm. Flute and violin take turns playing against the harmonica which is really quite nice. At the 2:06 mark the ambiance is broken as the main theme reappears with muted horns and drums ending the cue with a sense of anticipation. “War Wagon/The Bridge/War Wagon Departs” links three scenes. It begins with an almost march like variant of the main theme as the War Wagon prepares to depart. As the War Wagon departs the ballad theme unexpectedly returns to conclude the complex cue. “Steady Fingers” is a pure suspense cue and is portentous as muted horns display the main theme. At the 1:31 mark the music gains energy as we hear a reprise of the main theme. “Dust Gag/Ambush” is the premier action cue of the score. It opens with a dissonant burst of the main theme and begins a sustained kinetic pace. 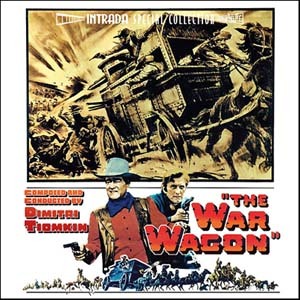 Tiomkin unleashes the orchestra with horns leading the way and keeps throwing one variant of the main theme after another as Jackson and his men try to over take and over come the War Wagon. The cue slowly wanes and ends with a muted statement of the main theme. In “Get That Wagon!” the secondary theme driven by ostinato strings which drive the cue with great vital energy eventually playing against the main theme. This is the only cue where we experience a synergy between these two themes and it is a show piece cue. Lastly, it is my practice to not invest time reviewing what I call score fragments; here defined as cues about one minute or less in length. It is my experience that the music cannot sufficiently develop and articulate a melody or theme to make a cogent statement or lasting impression. There will be occasional exceptions, and if so, I will include them. As such, after listening to the score, I have decided to bypass and not comment on the following six fragmentary cues; “Dark Street”, “Meeting”, “Mexican Getaway”, “Wading War Wagon”, “Spool of Wire” and “Vantage Point”. We can thank Intrada for resurrecting the score from the hallowed vaults of Universal Studio. The score is newly mixed and mastered in full stereo from the actual multi-track session masters. My compliments to Intrada for a most welcome release. Tiomkin again succeeds in providing a beautiful Americana score. The twelve note main theme is not what esteemed movie critic Roger Ebert asserts is “Clang, Clang, Clang Goes the Trolley played backwards!” It is instead in my opinion a classic American western theme for which Tiomkin displays his immeasurable talent. The intricate secondary theme is also excellent and I found the CD listening experience quite enjoyable. This was a fun score to listen, and as such, I assign it a four star rating. I recommend it to Tiomkin lovers and collectors as a worthy addition of classic Americana film scores. Music composed and conducted by Dimitri Tiomkin. Orchestrations by David Tamkin, Gil Grau and Leonid Raab. Album produced by Douglass Fake. While not essential Dimitri Tiomkin, I found this score to be very entertaining and what a title song ! It reminds me when I was a kid watching at the tv all these wonderful john wayne westerns. Your review is just perfect with a hint of nostalgia.